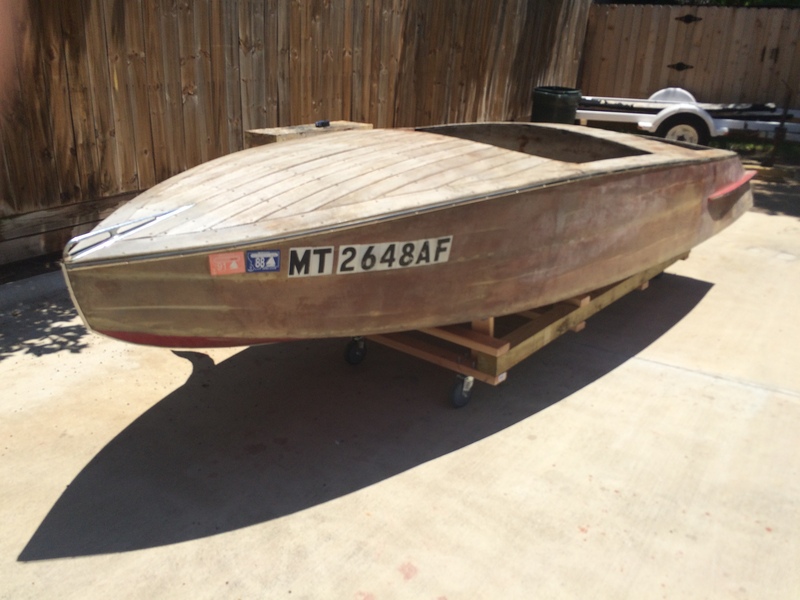 When my 1948 Speed Liner 14′ Trophy Deluxe Racing Runabout arrived from Montana the mahogany hull sides and plywood bottom were covered over with fiberglass. To a purist, covering mahogany hull side planks with fiberglass is a blasphemous act. However, to a Montana farmer who didn’t want to take the time to soak the boat every season, it made perfectly good sense. 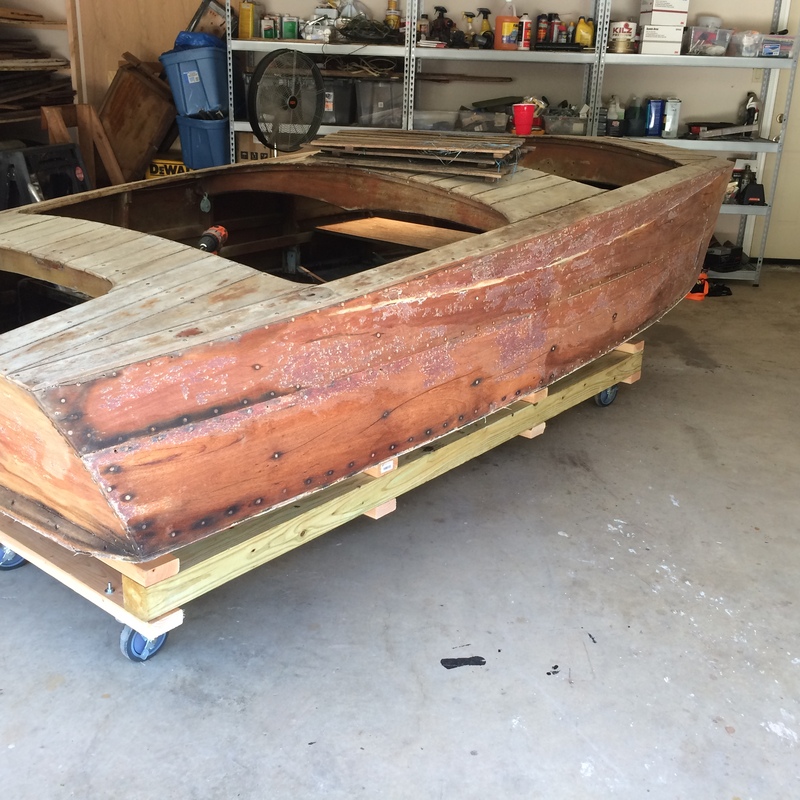 As sensible as that solution may have been to him, by the time I got the boat the fiberglass had bubbled and pulled away from the wood and was in desperate need of being removed. For those of you who have done this before, you will know that old fiberglass peels off in long strips like a bad sunburn. Unfortunately, it leaves resin residue that takes a significant amount of effort to remove. The best method I have found is to use a heat gun and a scraper. Nevertheless, it is still a lot of work and not all that much fun and tends to put your hands at great risk of being burned. In the end, it really didn’t take that much time to strip all the fiberglass off the hull sides and most of my burns are almost healed. I still have not stripped the fiberglass off the hull bottom because I will have to flip the boat over to do that. Once I had the fiberglass stripped off I discovered that there were large through-and-through cracks and splits all along the hull sides, and the planks were bowed and warped, leaving a substantially non-fair surface. Because of these splits I decided I needed to remove the hull side planks and replace them with new mahogany. Currently, there are only two planks on each side, each of which ranges to as wide as 9-1/2″. To remove the top plank on the port side I needed to extract approximately 250 screws. Of course, considering that the boat is now 67 years old, those screws did not want to come out voluntarily. Maybe 20 percent of them came out with a screwdriver; the rest required a fight and had to be removed with a pair of vice grips. While I was hoping to save the wood for templates for the new planks; unfortunately, the old mahogany was so brittle, it disintegrated upon removal. Thankfully, the underlying frames all appear to be in pretty good shape. Since the original planks were so wide, there is only one row of seam battens between the sheer line and the chine. My plan is to use four rows of new mahogany planks, so I will have to install two new rows of mahogany seam battens to support them. In order to help me envision how the new planks should be sized and structured I built a spiling batten. This is basically a pattern of a section of planking made necessary because the original plank was too damaged to trace after removal. I made this template from 20″ X 30″ illustration board, which is like heavy poster board. I cut 5″ strips and pinned them end-to-end to the frames along the line of the existing seam batten. Then I laid a long straight-edge along the top of the spiling batten, which proved that I would be able to lay a straight plank the entire length of the boat. I needed to do this because the boat is an unusual shape. The bow comes almost to a point, the hull sides widen in the middle, and then narrow again at the stern where there is also a steep tumble home. This spiling batten also helped me to determine the appropriate width for the new planks, which will be 4-1/2″. The sheer plank, which is the top plank, will vary in width because of the shape of the boat. It will have to be shaped right on the boat. The existing planks are approximately 5/16″ thick; however, when I bought my new mahogany I had them mill it to 1/2″ thick. I think I am going to go with the greater thickness, even though this will add weight to the boat. However, this is going to be a show boat and not a race boat, and I am looking for greater strength and more flexibility in fairing the hull sides to perfection. This will also allow me to use mahogany bungs, rather than putty for covering the screw holes, as is currently the case. I have committed to taking my time with this boat to make sure I end up with a maximally high quality product. It’s not typically in my nature to be patient, so this will surely be a bit of a challenge for me.